Imagine a group of organisms so varied they seem to be from another planet. Protists are such a group. Some of them are sculptured diatoms; some have long threads or hairs that move. Some constantly change shape. Welcome to the world of protists. Protists are one-celled organisms that feed on bacteria, dead matter and even other protists. Some use flagella, which are whip like threads, to push themselves around. Most of these one-celled organisms live in wet places, such as oceans, lakes, ponds, rivers and streams. Protozoa are protists who move around in search of food. 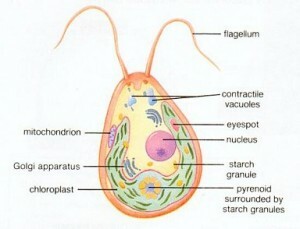 There are two groups of protists – protozoa and algae. Protozoa move around in search of food. Algae use sunlight like plants to get their food. Protists usually get their food from the environment. Some are parasites. These are called pathogens. They live on humans or other animals to get their food. Pathogens can cause dangerous diseases like malaria and sleeping sickness. 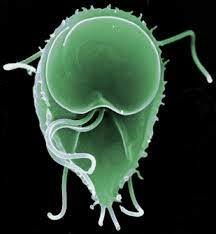 Giardia lamblia is a protist pathogen that causes serious diarrhea. People usually get it by drinking water or eating food that has the pathogen. In tropical countries, people sometimes get elephantiasis, which causes swollen feet, legs and other body parts. It is caused by a tiny worm. Algae are protists who use sunlight like plants to get their food. Giardia lamblia is a protist pathogen that causes serious diarrhea. A video presentation about the different types of protists. Question: Are protists animals or plants? Answer: Some protists seem like animals; others seem like plants. Some seem more like fungi. But they are actually none of the above. They belong to their own kingdom. Enjoyed the Easy Science for Kids Website about the Protist Kingdom info? Take the FREE & fun Protist quiz and download FREE Protists worksheet for kids. For lengthy info click here. Declan, Tobin. " 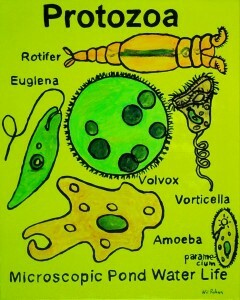 Protists Facts for Kids ." Easy Science for Kids, Apr 2019. Web. 18 Apr 2019. < https://easyscienceforkids.com/protists/ >.